Do you need a bison? (London’s Telegraph) – Do you need a bison? This family, from Texas, is looking to re-home their beloved pet so she can have a more comfortable retirement. Bullet weighs 71 stone (994 pounds) and is 8-years-old, and Karen Schoeve, his owner, thinks she could make a wonderful addition to a loving home. On a Craigslist advertisement, she wrote that “she is like a precious, giant dog”. Apparently, Bullet likes to chase and spar with a riding lawn mower, wheel barrow or her truck when she’s out in the field. 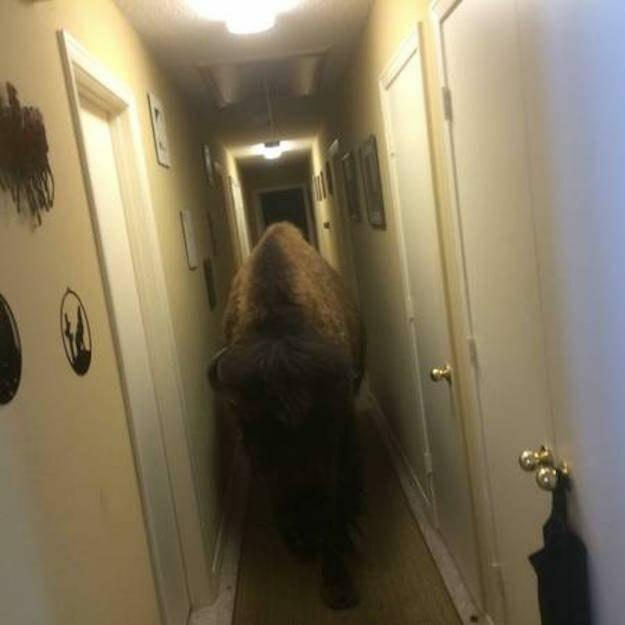 The bison is also completely house-trained. She has some requirements for the lucky person who gets to own Bullet. 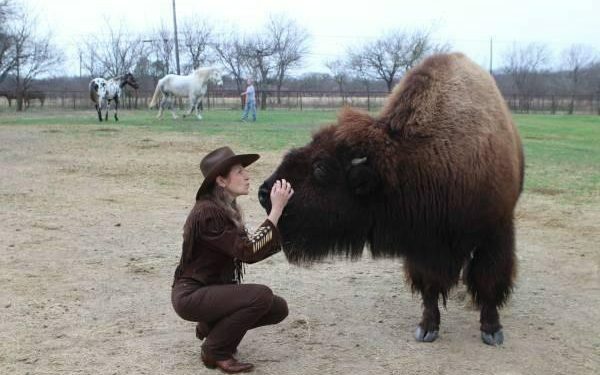 She wrote on Craigslist: “I really do wish for Bullet to go with another Buffalo (or a small herd) but do not want her to be turned out into acreage where she has no human contact. Anyone wishing to own Bullet must also recognize that “she must be revered and respected as a buffalo”. Mrs. Shoeve doesn’t want to part with Bullet, but is selling her to the right home for $5,950 so that she can have more land to roam as she ages. And if you’re worried about the animal being toilet-trained? “She has never gone to the bathroom [in the house], either,” Mrs. Shoeve told WFAA. (BBC) – The oldest known person in the world has died in New York aged 116. 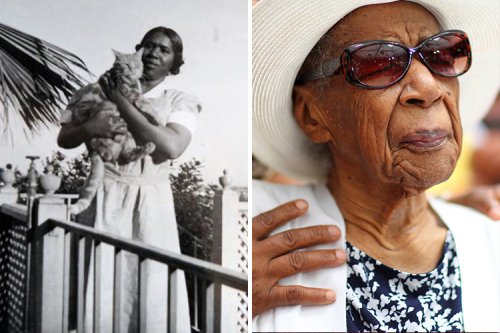 Susannah Mushatt Jones (July 6th 1899 to May 12th 2016) of New York was the oldest living person in the world till she died this past week at the Vandalia Senior Center in East New York, Brooklyn. She was 116 years old. She was the last living person in the US who was born in the 1800s. She lived in three centuries, through two world wars and 20 US presidencies. An Italian woman, Emma Morano, now takes on the title of oldest person in the world, and is thought to be the last living person to have been born in the 1890s. Ms Jones was one of 11 children. Her grandparents were slaves, her parents crop pickers. She attended a special school for young black girls and graduated from high school in 1922. She moved to New York to work as a nanny, where she helped to start a scholarship fund for young African-American women. Ms Jones remained active until the end of her life, serving as a member of the tenant patrol of her nursing home until she was 106. As one of the last few remaining human links with the 19th Century, Ms Jones has lived through more history than anyone else in the world. She was also born before the death of Queen Victoria in Britain, before Marconi sent the first ever wireless transmission, and before the Wright Brothers flew the first aircraft. Ms Jones always maintained that lots of sleep and no smoking or drinking were the main reasons she lived to celebrate her 116th birthday last year. But perhaps it was due to the pleasures she allowed herself in life too. In an interview with Time Magazine last year, she admitted to eating four strips of bacon with scrambled egg every day. The oldest person in the world is now believed to be 116-year old Emma Morano, who lives in Verbania in Italy. She was born in November 1899, according to the Los Angeles-based Gerontology Research Group.